This is a list of countries spanning more than one continent, sometimes referred to as transcontinental states. The definitions of what continent(s) a particular country covers may vary according to which criteria are used (whether purely geographical or geological or, on the other hand, political, economic or cultural criteria). An example is Russia, which has its historical core as well as most of its population (72%), economic activity and political institutions (such as its capital city) in Europe, yet geographically most of the territory (71%) is actually in Asia. The land border between Asia and Africa is considered to go along the Isthmus of Suez and the Suez Canal in Egypt. The border continues through the Gulf of Suez, Red Sea and Gulf of Aden. Two of 29 governorates of Egypt lie entirely on the Asian Sinai Peninsula and two are transcontinental: Ismailia Governorate is nearly equally divided by the Suez Canal, and Suez Governorate, which is coterminous with the transcontinental city of Suez, has a small portion east of the Canal. Western sources, such as the National Geographic Society, usually state that the Europe-Asia boundary follows the watershed of the Ural Mountains to the source of the Ural River, then follows that river to the Caspian Sea. The border then follows the watershed of the Caucasus Mountains from the Caspian Sea to the Black Sea. This is the definition illustrated in this section, although variations exist. Armenia and Cyprus – although considered European states by the European Union, they are situated in Western Asia. Georgia's regional borders cross the main Caucasus watershed perpendicularly in the east-central region of the country, though some of its subdivisional lines follow it. Georgia's seven transcontinental regions are Shida Kartli, Mtskheta-Mtianeti, Kakheti, Abkhazia, Svanetia and half of Imereti. Racha and Samegrelo. While four: Ajara, Guria, Samtskhe-Javakheti and Kvemo Kartli are in Asia. The Java district of Shida Kartli is transcontinental (mostly in Europe) and the region's other four districts are entirely within Asia. The Kazbegi and Dusheti districts of Mtskheta-Mtianeti are transcontinental, with the Khevi subdivision of Kazbegi and the Khevsureti subdivision of Dusheti being entirely in Europe and the Mtiuleti subdivision of Kazbegi being transcontinental, and the region's other three districts are entirely within Asia. The Akhmeta district of Kakheti is transcontinental, with its Tusheti subdivision in Europe, and the region's other seven districts are entirely within Asia. Georgia is a member of the Council of Europe. Kazakhstan's provincial borders do not follow the Ural River, although some of its western district borders do so. Two of the provinces are transcontinental, Atyrau Province and West Kazakhstan Province. The capital of the former, Atyrau, is split by the mouth of the Ural and is a transcontinental city. Almost all of it is in Asia with a small portion in Europe. Two of Atyrau Province's districts are entirely in Europe, three of its districts are entirely in Asia, and its Inderskiy and Makhambetskiy districts are transcontinental. Five of West Kazakhstan's districts and the province's capital city of Oral are entirely in Europe, five of its districts are entirely in Asia, and its Akzhaikskiy district is transcontinental. Russian regions' borders follow the Ural Mountains and Ural River closely enough. There is a very small area (less than 300 km2) of Russian territory south of the main Caucasus watershed in Asia. Orenburg on the Ural River is a transcontinental city. More detail on the political divisions through which the intercontinental boundary runs can be found here. Russia is a member of the Council of Europe. Three of Turkey's provinces are entirely in Europe while Çanakkale and Istanbul are transcontinental provinces. Three of Çanakkale's districts are entirely in Europe and its other nine districts are entirely in Asia. Nineteen of Istanbul's districts are entirely in Europe and its other twelve districts (forming Anatolia) are entirely in Asia. There are alternative borders of Europe and Asia that consider Armenia transcontinental (the north of the country in Europe and the south in Asia). And on a rare definition using the watershed of the Lesser Caucasus, isolated spots on the north of Iran could be placed in Europe, but this is normally not considered. Most authorities and most Panamanians consider Panama to be North America's southernmost nation, entirely within both Central America and North America. An alternative view is that the man-made Panama Canal, being a concrete line to demarcate the Isthmus of Panama, divides the continents. That would place Darién Province and four comarcas indígenas entirely in South America. Panamá Province and Colón Province would both be transcontinental, with Colón nearly equally divided between both Americas and Panamá Province unequally divided, with nearly a 1:4 ratio in South America's favour. The Pearl Islands and Taboga Island in the Gulf of Panama are part of Panamá Province and would be associated with South America and North America, respectively. Six other provinces and the comarca indígena of Ngöbe-Buglé would be entirely in North America. Greece: though very rare, considering the continental shelfs of Asia and Europe as being separated, some Greek islands near Turkey lie on Asia, such as the Aegean Islands and the Dodecanese. Greenland: Greenland is today a territory of Denmark, fully located on the North American tectonic plate and close to the mainland, and is considered to be geographically part of North America. 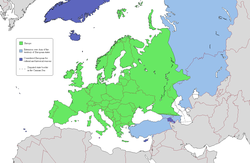 Although it is politically associated with Europe and internationally represented by a European country (including in the Council of Europe), it is largely autonomous. Historically and ethnically, its native population is of American tradition, although it also shares cultural links with other native peoples bordering the Arctic Sea in Northern Europe and Asia (today in Norway, Sweden, Finland and Russia), as well as in North America (Alaska in the U.S., Northwest Territories and Nunavut in Canada). Greenland was part of the Danish territory and within the territory of the European Union, but voted for a larger autonomy and is now excluded from it. Iceland: Iceland is located on the fracture line splitting the Northern Atlantic Ocean between the North American plate and the Eurasian plate. Geographically, it is much closer to North America than it is to Europe. Under a pure geological definition, Iceland would qualify as a transcontinental country ; however, ethnically, historically, and culturally, this country, well defined by the borders of its main island which was never split in separate cultural areas, is commonly considered to be European. Iceland is a full member of the Council of Europe (but still not in the European Union, to which it could qualify). Portugal: Continental Portugal is in Europe, while the Azores archipelago (also associated with Europe) has two islands (Corvo and Flores) that are part of the American plate (which made it a tricontinenal country, see Africa and Europe section below). France: Metropolitan France is in Europe, while the four Overseas Departments are in other continents. Guadeloupe & Martinique are in North America, French Guiana is in South America, and Réunion is in Africa. These four French Overseas Departments are legally and administratively an integral part of France. France will gain a second African region when Mayotte becomes an overseas department in 2011. There are other island possessions associated with North America, Africa, Oceania, and Antarctica that are French overseas collectives or part of the French Southern and Antarctic Lands, but these are not integral parts of France. Italy: Although mainland Italy, Sardinia, Sicily, the Aegadian Islands, Ustica, and the Aeolian Islands are associated with Europe, the closest land to Pantelleria and the Pelagie Islands (Lampedusa, Linosa and Lampione) is Tunisia on the African mainland. Anyway Pantelleria and Linosa are considered part of Europe, Lampedusa and Lampione part of Africa. Portugal: Continental Portugal is in Europe, while the archipelago of Madeira, an autonomous region of Portugal (including Porto Santo Island, the Desertas Islands and the Savage Islands), is associated with Africa. If we consider that the Azores autonomous region of Portugal has two islands that are part of North America (see Europe and North America section above), Portugal is a tricontinenal country. Spain: Although its mainland is in Europe, Spain has holdings (the Canary Islands in the Atlantic, the cities of Ceuta and Melilla on mainland North Africa and its Plazas de soberanía close to that cities) that are geographically part of Africa. Canary Islands, Ceuta and Melilla are three of the 17 Autonomous Communities that form Spain, while the Plazas de Soberanía are under different military status. The African Mediterranean island of Isla de Alborán belongs to the transcontinental city of Almería and the transcontinental province of Almería. Yemen: Although mainland Yemen is in the southern Arabian Peninsula and thus part of Asia, and its Hanish Islands and Perim in the Red Sea are associated with Asia, Yemen controls the archipelago of Socotra, which lies east of the horn of Somalia and is much closer to Africa than Asia. Socotra and the Hadramawt region constitute the transcontinental Hadramawt Governorate. Australia: The Commonwealth of Australia consists of its namesake continent and island possessions associated with Oceania, Asia, and Antarctica. Its Indian Ocean island possessions of Christmas Island and the Cocos (Keeling) Islands are associated with Asia. The majority of the ancestry of Australia's Asian island residents is Asian and the majority of them are Muslim or Buddhist. Japan: All of Japan consists of Asian islands except for the remote Bonin Islands, which are a few islands located in the Pacific, and administratively part of the city of Tokyo and the subdivision of Ogasawara Village. Papua New Guinea: Anthropologically Papua New Guinea is a part of Melanesia and is sometimes included in the Malay Archipelago of Southeast Asia. It is now seeking membership in ASEAN which it had been in since the 1970s. Philippines, Malaysia, Indonesia, Timor-Leste, Brunei and Singapore: The Malay Archipelago lies on the border of Oceania and Asia. Depending on the interpretation of the border, Philippines, Malaysia and Indonesia can be considered transcontinental countries and Timor-Leste, Brunei and Singapore can be in either side. United States: While the territory of the United States lies overwhelmingly in North America, it includes the state of Hawaii in Oceania, as well as other Oceanian island possessions and Alaskan islands on NE Asia's continental shelf. Aruba, Bonaire, Curaçao and Trinidad and Tobago: The sea islands division of South America and North America is complicated. All Caribbean islands are often labeled as North American. But the Dutch dependencies of Aruba and Curaçao, the Dutch special municipality of Bonaire and the state of Trinidad and Tobago lie on the continental shelf of South America, and can be considered South American as well. Note that all these islands have closer cultural ties with North America. Venezuela: Mainland Venezuela is on South America, but Isla Aves are geographically North American. Isla Aves is one of the Federal dependencies of Venezuela under the administration of the transcontinental city of Caracas. The Netherlands has the Caribbean island possessions of Curaçao, Sint Maarten and Aruba. In addition, after the split of the Netherlands Antilles the Caribbean islands of Bonaire, Saint Eustatius and Saba became special municipalities incorporated into the metropolitan Netherlands, making it a transcontinental country as well. These examples have integral parts associated with other continents. France, Norway, South Africa, and the United Kingdom may also be considered transcontinental by virtue of distant island possessions associated with a continent other than where the country is based. ^ As a transcontinental country, Georgia may be considered to be in Europe and/or Asia. The UN classification of world regions places Georgia in Western Asia; CIA world factbook and Encyclopædia Britannica also place Georgia in Asia. ^ "Other European countries: Georgia". europa.eu. http://europa.eu/abc/european_countries/others/georgia/index_en.htm. Retrieved 17 November 2010. ^ "Georgia country profile". 7 July 2010. http://news.bbc.co.uk/2/hi/europe/country_profiles/1102477.stm. Retrieved 17 November 2010. ^ "Subscriber log in". Oxford Reference Online. http://www.oxfordreference.com/views/ENTRY.html?entry=t186.e21064&srn=1&ssid=416740626#FIRSTHIT. ^ "Georgia". Merriam-Webster's Collegiate Dictionary. http://www.m-w.com/dictionary/Georgia. This page uses content from the English language Wikipedia. The original content was at List of countries spanning more than one continent. The list of authors can be seen in the page history. As with this Familypedia wiki, the content of Wikipedia is available under the Creative Commons License.